The Italian fashion house famed for a bold yet sophisticated aesthetic, presents its offering for the younger market with Armani Exchange. 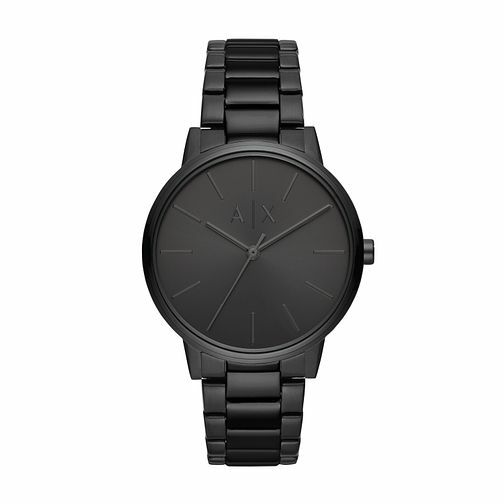 Make a defining fashion statement with this black stainless steel Armani Exchange watch. The striking all black design gives this timepiece masculine charm, whilst the black dial, complemented by the black time markings make for a always fashionable all black look. Instantly upgrade your style with this Armani Exchange watch. Armani Exchange Black Stainless Steel Bracelet Watch is rated 4.5 out of 5 by 2. Rated 4 out of 5 by Anonymous from Looks great and quality This was a present for my 17 year old son. He loves it. The only criticism I would have is that my son would ideally like it tighter but all the removable links have already been taken out. Perhaps a minimum wrist circumference should be specified. Rated 5 out of 5 by Anonymous from Product is perfect Perfect in every way, looks great, fits great and well... funny enough it tells the time.